Here’s a snap of all my currently loving lippies..
As you can see from the snap above…. Often called as dupe of MAC Daddy’s Little Girl. This is a gorgeous wearable shade!! Its very soft on the lips. stays on for 4 hours approx…This is a shade which suits most of the skin tones!! A must try from the brand!! Here is my lip swatch above wearing Hope and clear gloss on top!! such a gorgeous shade..Isn’t it…. Here is a snap of me wearing my all time favourite Honey Douce!! Its a shade which is almost natural, differs from people to people!! My way to go shade!!! Hope you all liked my favourites!! 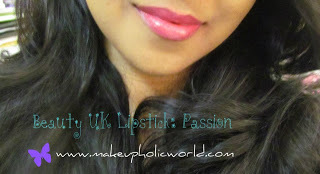 I am tagging some of my all time favourite bloggers to do this favourite lip products tag!!! Enjoy the Tag!!! I would love to see all of yours favourites too!!! wow Renji… its so difficult for me to say which amongst your top 5 i liked the most !! thnks for doing this post ! !